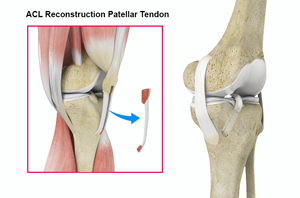 Anterior cruciate ligament reconstruction patellar tendon is a surgical procedure to replace the torn ACL with part of the patellar tendon taken from the patient's leg. The new ACL is harvested from the patellar tendon that connects the bottom of the kneecap (patella) to the top of the shinbone (tibia). The procedure is performed under general anesthesia. Your surgeon will make two small cuts about ¼ inch around your knee. An arthroscope, a tube with a small video camera on the end is inserted through one incision to see the inside of the knee joint. Along with the arthroscope, a sterile solution is pumped into the knee to expand it providing the surgeon a clear view of the inside of the joint. The torn ACL will be removed and the pathway for the new ACL is prepared. Your surgeon makes an incision over the patellar tendon and takes out the middle third of the patellar tendon, along with small plugs of bone where it is attached on each end. The remaining portions of the patellar tendon on either side of the graft are sutured back after its removal. Then the incision is closed. The arthroscope is reinserted into the knee joint through one of the small incisions. Small holes are drilled into the upper and lower leg bones where these bones come together at the knee joint. The hole's form tunnels in your bone to accept the new graft. Then the graft is pulled through the predrilled holes in the tibia and femur. The new tendon is then fixed into the bone with screws to hold it into place while the ligament heals into the bone. The incisions are then closed with sutures and a dressing is placed.